The Ocean Beach Wellness Center looks like any other retail establishment lining OB’s eclectic Newport Avenue: plate-glass windows reveal hip, eco-friendly wares for sale — and invariably young, attractive women behind the counter. Shoppers browse through locally crafted hemp jewelry, organic apparel and upscale health products to their hearts content, pausing if they like to take a seat in one of the plush, inviting chairs in the corner. Except these chairs aren’t meant for marathon shoppers looking to take a load off; they’re intended for medical marijuana patients waiting to enter the center’s back room and pick up some choice herb. 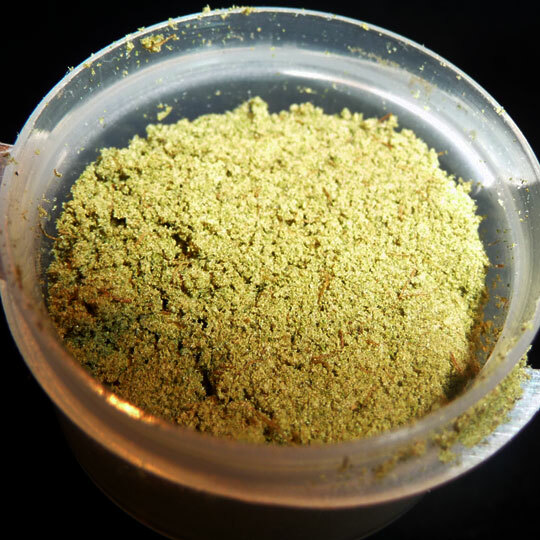 Humbolt Kief, a concentrate. Photo from the website for The Ocean Beach Wellness Center. Unlike the many medical cannabis dispensaries operating under the radar, the Ocean Beach Wellness Center offers a glimpse of marijuana’s potential integration into the consumer mainstream. The co-operative distinguishes itself by presenting a casual, consumer-oriented and accessible environment; but on a state and even San Diego-wide basis, this distinction may soon become the norm. California’s relaxed attitude towards the use of cannabis has set consumer outreach and aggressive marijuana marketing on the rise. Flip to the back of an alternative weekly printed anywhere from San Francisco to San Diego and you’ll find a barrage of bright, colorful and even downright professional advertisements for medical cannabis. Whether they harbor promises of affordable patient cards (obtainable these days for a mere $60), organic buds or luxurious dispensary facilities, these ad blasts offer direct proof of California’s growing comfort with commodified marijuana. For now, of course, the wealth of marijuana retail options and environments advertised remain exclusive to medical marijuana patients; but thanks to the initiatives proposed under the Regulate, Tax and Control Marijuana Act of 2010, also known as Proposition 19 and slated to appear on California ballots this November, this exclusivity could soon become a thing of the past. For all the advertising glitter surrounding medical cannabis these days, the industry itself – legal in California since 1996 under Prop. 215 – still encounters a host of problems when it comes to the federal government. If Prop.19 passes, cannabis possession, use and retail laws will undergo significant change. But how likely are we to see the law take effect? And how much will controlled cannabis sales impact medical marijuana laws, dispensaries, patients and the consumer experience? First, a little background: Prop. 19 aims to legalize possession and private usage of up to one ounce of cannabis, as well as the cultivation of cannabis plants within a 25 square-foot plot per residence, for use by adults aged 21 and over(#1). Under the new law, local governments would tax and regulate cannabis, restricting its use in public or in the presence of minors and retaining the power to prohibit the sale of cannabis in their individual communities if they so chose. In other words, cities will have the choice to keep the buying and selling of cannabis illegal within city limits; however, citizens of these cities may still possess cannabis legally under the provisions of the state law. Considering the potential for impressive revenues at both local and state levels as a result of regulatory taxes, proponents of the act hope that the promise of economic improvement will encourage many local governments to opt in favor of legal cannabis. Proponents like Simms and McNamara are vital for the success of Prop. 19, and their arguments carry definite weight. But the race is tight; and with a vocal segment of the medical marijuana community standing against it, the Regulate, Tax and Control Marijuana Act is no shoo-in. For anti-drug activists and law enforcement officials in Manheimer’s camp, this position makes perfect sense. But what about the medical marijuana users and purveyors against legalization – voters for whom sustained access to marijuana is paramount? Why are they lining up alongside detractors like Manheimer at the polls? Amir Daliri, president of the Cascade Wellness Center dispensary, tells the Associated Press that the law’s allowance for prohibition of cannabis sales would adversely affect medical marijuana patients – particularly “the sick, the elderly – patients who cannot grow their own and cannot travel to pick up a prescription.”(#7) Dragonfly De La Luz, a writer and self-proclaimed “professional stoner” from San Francisco, further explains that the law would be tantamount to “corporate takeover” of marijuana, allowing big businesses to profit from recreational sales of the drug while the needs of individual fall by the wayside(#8). Both Daliri and De La Luz’s arguments are valid; but they conceal a third and especially critical concern on the part of the medical marijuana community: money. De La Luz puts the money-grubbing blame in the hands of legalization supporters, claiming that the business of recreational cannabis sales will “corporatize” cannabis and bulldoze the needs of individuals; but Prop. 19 advocate and president of the Inland Empire chapter of the Marijuana Anti-Prohibition project Lanny Swerdlow tells the Inland Valley Daily Bulletin that the law would in fact “allow for large-scale growing outdoors which should help bring the price down substantially,” making the drug accessible to limited income patients who cannot afford the current high price of medical cannabis. “I never ever want to hear a 75-year-old lady in chronic pain tell me that she has to use Vicodin because she can’t afford to buy the marijuana,” says Swerdlow. (#9) Many proponents of the legalization initiative insist that “Stoners against Legalization” (so dubbed by NORML) fear huge financial losses for the medical marijuana industry in the wake of cannabis price cuts — and that their claims of patient disadvantage are merely masking profit-driven objections to the law. How much evidence is there to justify De La Luz’s position on corporate cannabis, or Daliri’s fears for infirm patients cut off from their medicine? What about price cuts and the dispensary owners’ dilemma? The debate over these concerns is as heated as it is vague, mired in conjecture and the realities of what San Diego medical marijuana attorney Jefferey Lake describes as a new and “legally challenging” area of the law(#10). There is no way for proponents of Prop. 19 to guarantee high tax revenues from legal marijuana sales; in fact, if legalization does cause cannabis prices to drop as low as some have predicted (a study published by the RAND Corporation indicates that marijuana prices could fall by as much as 80 percent)(#11), resultant tax revenue might be minimal at best. So lets suppose California legalizes recreational marijuana this November: what happens to consumers? This writer predicts that accessibility will explode onto the market scene, with advertising hot upon its heels. With the advent of legal cannabis, we could see retail establishments like the Ocean Beach Wellness Center popping up all over the place, executing targeted marketing strategies and perhaps drawing heretofore underground consumer groups to the forefront. Consider the head shop – retail’s stereotypical homage to mainstream marijuana consumer culture. Ubiquitously dark, incense-laden dens replete with Bob Marley posters, intricate pipes and stoner accoutrement, these places are clearly designed for the predominantly male market most likely to own multiple copies of Harold and Kumar Go To Whitecastle. But according to Pepper and Margot*, the ladies behind social movement and stoner blog PotCouture.com, there’s a thriving community of “ladystoners” out there, waiting only for an end to the stigma imposed by illegal cannabis to emerge from behind veils of corporate success and feminine decorum. Add that force to existing and emerging cannabis consumers, factor in the already aggressive medical marijuana marketing campaign, and all of a sudden “pot couture” doesn’t sound far fetched at all. Coach cannabis handbags, anyone? Prada-emblazoned pipes? The possibilities seem endless; but only time will tell if Prop. 19 can live up to the hype. *(The characters referred to as Margot & Pepper on the PotCouture.com site are amalgams and the actions and words attributed to the characters are not necessarily representative of any persons, living or dead). #1 Section 3, Section 11300. Proposition 19: The Regulate, Tax and Control Cannabis Act of 2010. Web. #2 Public Policy Institute of California. “Statewide Survey: Californians and their government,” September 2010. Web. #3 Armentano, Paul. “Prop. 19 Increasingly Popular Among California Voters.” NORML, 30 September 2010. Web. #4 “California Measure Shows State’s Conflicted Link to Pot.” The Associated Press. NPR.org, 26 September 2010. Web. #5 Botwin, Nancy.“Kimberly Simms is a Medical Marijuana Attorney on a Mission.” NUG Magazine 14 July 2010. Web. #6 “Top Ballot Item: Bid to Legalize Pot in California.” The Associated Press. NPR.org, 8 September 2010. Web. #7 Hindery, Robin. “Medical pot advocates oppose Calif. Legalization.” The Associated Press, 21 September 2010. Web. #8 Stoners Against the Prop. 19 Tax Cannabis Initiative. 2010. Web. #9 Emerson, Sandra. “Prop 19 Pot Cost Effect Debated.” Inland Valley Daily Bulletin, 2010. Web. #10 Moran, Greg. “Lawyers find niche in haze of medical pot.” The San Diego Union Tribune 26 September 2010. Print. #11 RAND Corporation News Release. “Legalizing Marijuana in California would sharply lower the cost of the drug.” 7 July 2010. Web.